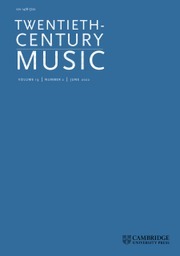 Twentieth-Century Music disseminates research on a broad spectrum of scholarly interest in the long twentieth century. We welcome submissions on all kinds of musical practice, including folk and popular music, media and film music, as well as art music and sound art. We also encourage submissions from a similarly wide variety of methodological and disciplinary perspectives, including ethnomusicology, archival research, cultural studies, and analytical work which engages with broad historical arguments. The reviews section offers agenda-setting responses to newly published work. David Cline, The Graph Music of Morton Feldman (Cambridge: Cambridge University Press, 2016), ISBN 978-1-107-10923-0 (hb). - Alistair Noble, Composing Ambiguity: The Early Music of Morton Feldman (Abingdon, UK: Routledge, 2016 ), ISBN 978-1-138-27053-4 (pb), ISBN: 978-1-4094-5164-8 (hb). Kenneth H. Marcus: Schoenberg and Hollywood Modernism (Cambridge: Cambridge University Press, 2016), ISBN 978-1-107-06499-7 (hb), (Cambridge: Cambridge University Press, 2018), ISBN 978-1-107-65249-1 (pb). Cambridge University Press is delighted to welcome Alejandro L. Madrid as co-editor of Twentieth-Century Music.